I quite enjoyed this year's anniversary event. Unlike the earlier editions, the rewards are not too expensive, which makes for a less grindy experience. The quests have been streamlined, with regional announcements when an event starts and swift travel horses to the festival areas. I was also surprised to get level appropriate XP for participating. My level 101 lore-master gets 41k XP per quest! At this rate, it looks like she'll get to 102 just by doing the anniversary event. In this post I'll show you some of the cool stuff you can get this anniversary. I'll also share some tips on how to get anniversary tokens. Here are some cool things you can get this event. New this year is the Windfells Goat, a steed looking similar to the druggavar found in Enedwaith and Dunland. I just had to get this creepy-looking animal for my evil rune-keeper Ravalinde, Abuser of Amusment. It cost 40 anniversary tokens, which didn't take me long doing the beer brawl. This is the reason for the anniversary's popularity this year: you can trade 40 tokens in for a starlit crystal! These rare items increase the maximum DPS or outgoing healing of your legendary or imbued items and are well worth getting for any character at or near level cap. Note that the crystals are bound on acquire, so you'll have to collect the anniversary tokens on the character you want it for. Some of the cool stuff is exclusive to anniversary boxes. If your account is one year old you'll find the one year anniversary box in your inventory, if it's two years old a two year anniversary box, etcetera. It doesn't matter if you've been actively playing or not. Since the game is nine years old, the ninth anniversary box is the most recent addition to the game. The Festive Azure outfit is from the four year, the steed from the five year anniversary boxes. 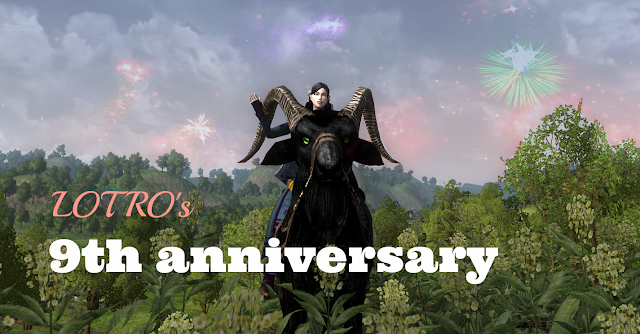 You get a warsteed version in the six year anniversary box. The Reveller's Shield of the Odogil (worn on the back) is gained from the seven year anniversary box. My Gondorian guardian Ravalyn wears it with pride. Reusable Star Fireworks (in various colours) is gained from the seven and eight year anniversary boxes. This year I received the Hooded Cloak of the Woodland Realm from my eight year box. I like its look, but probably won't use it much because of the hood. I wish there was an unhooded version! My warsteed on the picture is wearing the Caparison of the Woodland Realm. You can buy it for 10 anniversary tokens; there's also a normal steed version. Although I started playing shortly after the game's release in the summer of 2007, I miss out on the newest anniversary box each year: only accounts older than 30 June 2007 get it. The nine year box reportedly contains White tree fireworks and a blue orb emote, but I'll have to wait another year before I can show you any pictures. 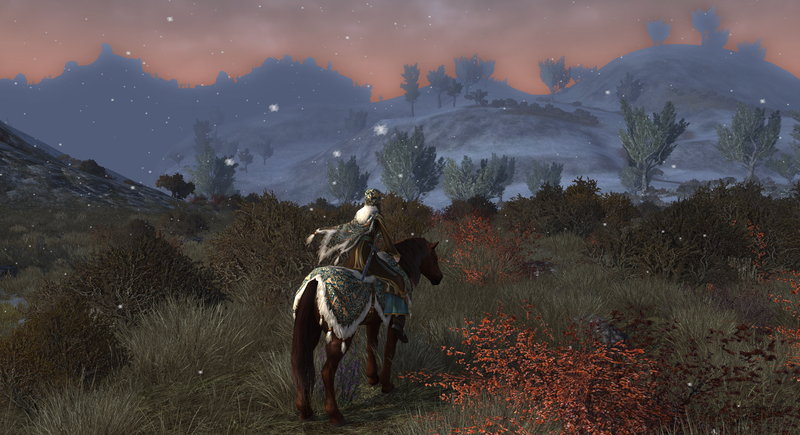 I usually like to explore when doing LOTRO events: riding around a bit, picking up event quests and finding out what they entail. After you've seen everything, though, I typically find out I need more tokens for the cool rewards. Here are some tips on how to get anniversary tokens. The fastest way of getting lots of tokens on one character is to do the bear brawl in the Thorin's Hall festival area (all the way down in the cellar). The dwarf Gísli Strongclub offers you the quest called The Mightiest Blow. The goal: to hit other players with a Dwarf-club of Unimaginable Power. The quest has three difficulty tiers: Basic, Intermediate and Expert. You'll have to finish the Basic version before the others unlock. Naturally, the expert version rewards with the most tokens (3), but it's more tricky than the others because you'll need to collect the Glorious Beer: an item that randomly spawns in the festival area and players will fight over. Run into the lower area and put the club that has appeared in your inventory on your skill bar. Pro-tip: keybind it to an easy-to-reach key, so you don't have to move your mouse around to click it during the event (you'll need the mouse for targeting other players). This will save you precious time. Ravalinde getting ready to smack people in the face. The club is bound to the R key. Be careful not to have your back to the entrance during the brawl: if you get knocked out of it by another player, the quest will fail! By (mouse) turning towards the centre of the brawl area and pressing the forward key while in the air, you will get punted less far. If you want to play it safe, you can keep your back to one of the four walls. If you have trouble hitting people with the club, remember that you need to be in range (3m) of your target, facing them and standing still when using the skill. It is a common courtesy to wait a bit when you're done to allow other players to finish their quests by bashing you around. Remember that the quest is timed, though: if you don't hand it in in time it'll fail. Fireworks being launched at the Bree fireworks show site. 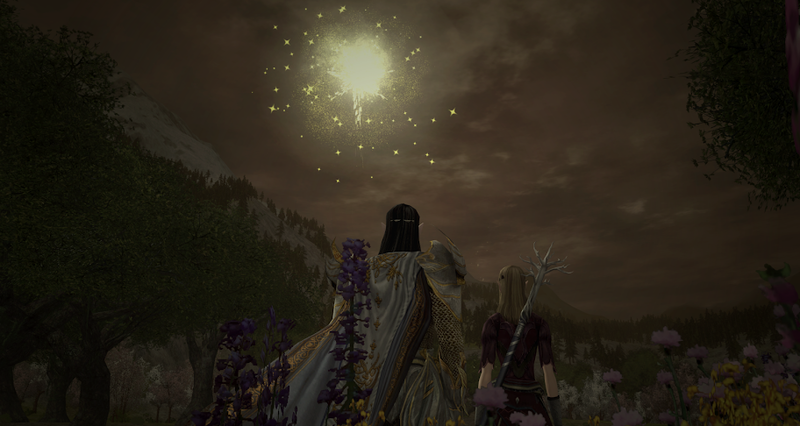 The most effortless way to get anniversary tokens on multiple characters is to park your alts in the Bree fireworks area and log them every half hour (the cooldown timer of the quest) to do the fireworks quest. There are two downsides to this method: 1) the quest is only up at night; 2) it takes a lot of time overall to get tokens. Nevertheless, the quest is fairly quick and rewards with two anniversary coins, and meanwhile you can level, PvP (or whatever it is you do) to your heart's content in between. What are you getting this year? Don't forget, the event ends on 8 May. Thanks for the timely guide. I'll have to get busy with the fireworks at least to see what I can afford by the time the event draws to a close. My main is now 99 so I doubt the starlit crystal will mean much to me for some time but maybe I can get enough before the 8th. I'll maybe give the beer brawl a try once just to have looked at it but PVP, even of the friendly kind, isn't really my thing. At least the fireworks is easy to fit in as you say amongst other activities! Yay, I'm happy to hear this is useful to someone! Actually, getting some starlit crystals for your main is not a bad idea. The best weapons you can get are imbued legendary items, and you can only imbue LIs of level 100 (they don't exist for level 105), which is only one level off. Unless you're playing super casual and don't ever play in a group, then gear doesn't really matter as much. TSUHELM (BLOGGER dont like my wordpress id! 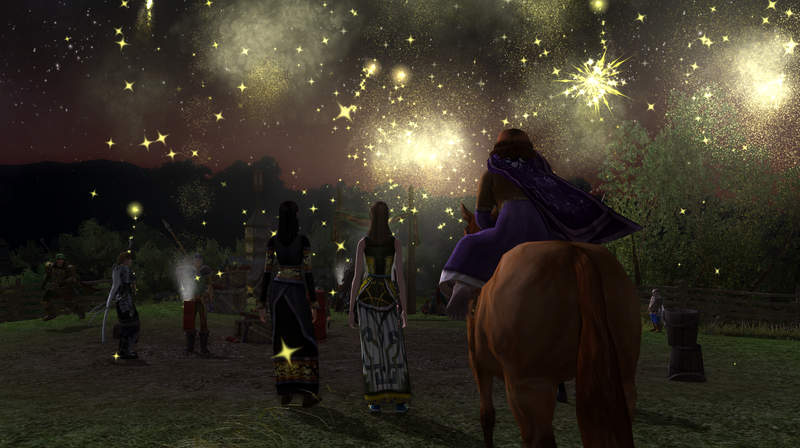 ): OH I think I will be heading to Bree for the Fireworks... I do like that goat! I love the goat, too! If it keeps being a problem, the Name/URL option should properly show your name with a redirect to your blog; have that up for people without accounts as well of bugs like this. Nice read :) The Anniversary festival is one of my favourits. It's easy, fun, and this year there are some new and very nice items to barter. I am no fan of goats, but the druggavar is awesome. 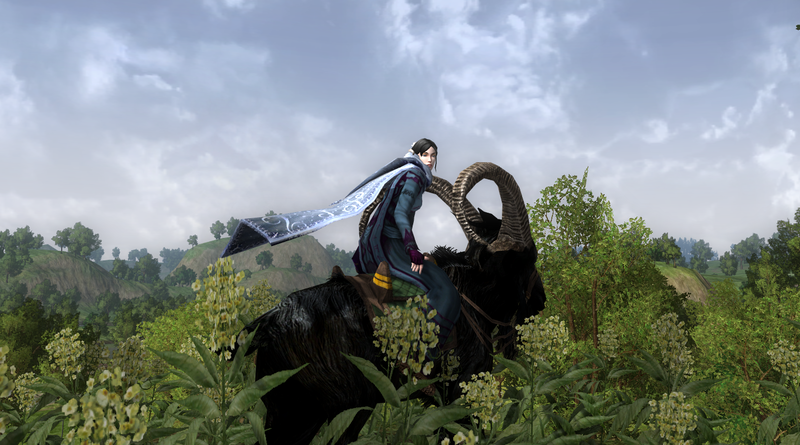 Riding it, with the big horns looks somewhat majestic (never thought I would use the word majestic for a goat, haha). It's the first goat I named, says enough. The Star-lits. Nice for people that need those, but like you said, if you never do groupplay, or fight in the Moors, you don't really need it. 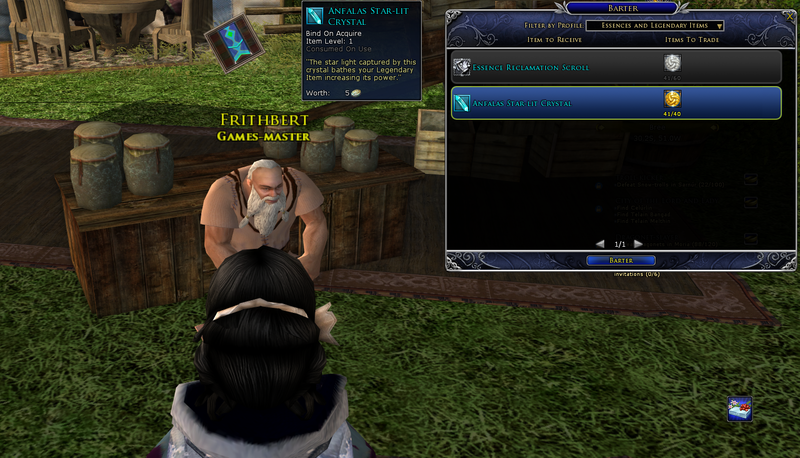 Still a great add to the barter items, many people love it. I still have to check out the Moria crystal lamp! It's probably not something for my house (Bree-land elf/human meshup), but Conrad should definitely get one for his dorf house. I need to bash some more heads at Thorin's, to be honest. I've been working my way through Eregion (considering my toons had never been above L16 before I picked up the game again, it's all new to me), so I've not done too much with the Anniversary Event. 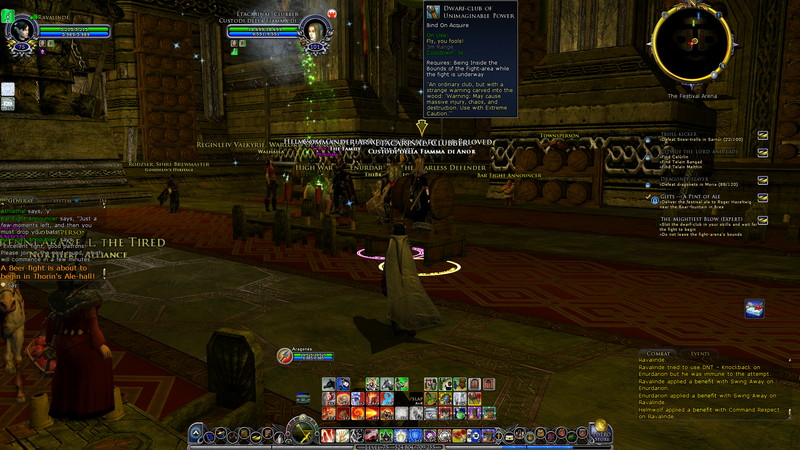 I've missed out on so many LOTRO events the same way. I know there's people that return to the game just for the festivals. That always baffled me, but to be fair, the anniversary quests are just as cute and well-written as the other quests in the game, and it's nice that you can do them at any level. Keep telling myself I'm going to start playing this...but then can never find the time >.< Guess I'll just have to keep living vicariously through you ;-) Totally want Windfells Goat to ride around in real life -look at those amazing horns! Those horns are pretty awesome, I agree. One wonders why it even needs a bridle to ride it.